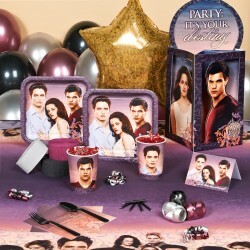 Twilight Breaking Dawn party supplies are now available from Celebrate Express! The Deluxe Party pack for 8 includes invitations, dinner plates, take home cups, forks, spoons, napkins, tablecover, centerpiece, foil balloon, regular balloons, curling ribbon, crepe paper rolls, and cake candles. If that is too much for you, you can also buy the pieces individually. The invitations, dinner plates, cups, napkins, tablecover, and centerpiece are all officially licensed Twilight products with the images of Edward, Jacob, and Bella on them. You can also get lenticular cups specific to Jacob or Edward (those are the cups that kind of shine as you turn them to the side). The best deal, however, is to buy the whole package together. In addition to those products, they also have some fun add-ons like Breaking Dawn buttons, bookmarks, sticker sheets, and dessert plates. You could use them for a Twilight birthday party, a Breaking Dawn movie party, or even just as gifts for a Twilight fan. See the entire Breaking Dawn party collection at Celebrate Express. Use code birthday11 to save 10% on orders of $65 or more.